Trump has imposed an import tariff on Canadian lumber. Why- because unlike most us Timber production much Canadian timber comes from government land on which a peppercorn rent is charged. Is this an implicit subsidy? No and Ricardo had the reason, bit nothing to do with comparative advantage – Canada doesn’t seem to have a comparative advantage in timber – indeed the reverse when transport costs to market are considered. The reason being his theory of land rent. That land rent doesn’t add to cost because in a competitive market firms paying rent are price takers not price makers. So if Canada charges less rent then an American rent their profits are higher – as the surplus iss plit less to rent rather than profits. So American producers to produce the same returns, and not switch capital to Canada, how to reduce costs, so they offer less rent, so American rents go down to match. If rents are not going down in the US it is a sign of market rigidities, lack of review clauses etc. in American Rental contracts, or landowners trying to gain economic rent – which is just a subtraction from society. So there you have it – this is not about American Lumber producers being driven out of business but American landloweners trying to earn unearned income from doing nothing – because Canada’s state ownership of forests stops the same rent seeking behaviour over the border. This letter has been interpreted as as ‘moratorium’ on new housing in Wealden. Its a bit more complicated than that. Over 1,000 units planned in the draft Wealden local plan were deleted following new evidence on car pollution and teh partial success of Welden;s legal challenge to Lewe’s local plan that it did not cosnider the requirement to look at the cumulative effect of Lewes and Wealdens local plans which cumulative breached teh 5% screening threshold. The household formation wont go away – this appears to have played no part in their weighing and balencing of evidence. People will simply squeeze into the existing housing stock and drive around the forest anyway. The loss of so many houses will push house prices up and so people will sit on appreciating assets – elderly retired people are far more likely to drive to the Forest, and on a daily basis, then younger working people. Have Wealden modeled the ‘policy off’approach, if not they have no evidential basis of harm and no basis for even involking article 6(1) or 6(3). There has been a lot of talk about the empirical turn in economics – and if this is good thing. It seems impossible to get published in the top 5 journals without a ‘model’ and to subject that to statistical testing against empirical data. Judgement of University publication rates affect scores which affect funding. Tenure depends on funding. If you doubt this creates a huge bias in the priorities of departments look at the department of Geography at the University of East Anglia which has dozens of Professors in the most obscure specialisms of geomorphology just to get into the top 5 most published departments globally, to no gain to students (why would they need four or five professors of glaciation?). The problem with this is it encourages researchers to go data dredging – consciously or unconsciously. Only the most interesting results which show positive correlations get published – not negatives – publication bias. A particularly glaring result of this comes from the field of behavioral psychology, One of its top researchers published a blog post. He had conducted an experiment at an all you can eat buffet. Customers were randomly charged either $4 or $8, the hypothesis was that those charged more would eat more was disproved. He then went on to publish three papers on the >0.95 p values they turned up. The results horrified the statistical community and now dozens of their papers have been scrutinised and glaring statistical errors found. Why because this is data dredging also known as p-hacking. Trawling data looking for positive p- values rather than selecting the sample independently of the data used to formulate the hypothesis enormously increases the chance of a type II error – a false positive. In economic data this is particularly likely as the number of sample countries are smaller and all are to some degree co variate. Also in economic data it is the ‘long tail’ events which have the most dramatic effect, but this can be swamped by the false positives which occur in the fat tail. When we set a p-value threshold of, for example, 0.05, we are saying that there is a 5% chance that the result is a false positive. So although we have found a statistically significant result, there is, in reality, no actual correlation. While 5% (arbitrary as it is) may acceptable for one test, if we do lots of tests on the data, then 5% p value threshold can result in an increasing number of false positives. Professors in brainstorming potential correlations and building endless models are making this probability ever higher. 538 blog has a live model where you can test this out p-hacking away until you get the right p-values. It is like the following example. 1 out of 1000 drivers are driving drunk. The breathalyzers never fail to detect a truly drunk person. For 50 out of the 999 drivers who are not drunk the breathalyzer falsely displays drunkness. Suppose the policemen then stop a driver at random, and force them to take a breathalyzer test. It indicates that he or she is drunk. We assume you don’t know anything else about him or her. How high is the probability he or she really is drunk? The answer is (from Bayes Theorem) only 2% because the type II errors swamp the positives – in other words the statistical power of the result is very low. How many papers in the top economic journals however even discuss power? A professor sits in his or room with their grad students. They discuss many hypotheses and test them. The ones that bear out (p vales) are published, those that arn’t are not. Publication bias. The problem here is the ‘researcher degrees of freedom’ subjective choices driving bias. Once you introduce the risk of type II errors in this way the chance of publishing a false positive rises to around 61%. Ioannidis’s paper on this – claiming most published papers in medical research was wrong – caused a crisis in the field. Similarly we have a replication crisis in behavioral psychology and many other fields. Why is not economics torturing itself on this? we know that around 1 in 3 economic studies dont replicate – almost exactly the figure probability theory would suggest. Well for a field that is traditionally decades behind modelling, philosophical and statistical advances in the rest of the social sciences it should be no surprise that it is congratulating itself on introducing errors discovered in other fields so long ago. The empirical turn in economics is simply a symptom of bad modelling. Dimensional errors, stock flow confusion, aggregation errors all proliferate. In a world of data mining the tools for empirical research based on big data are easy to use. The techniques to avoid p-hacking exist. you could hypotheise the future based on past events only. You can – lack good data mining practitioners- divide results in two so a data set used for exploratory work form hypotheses used entirely independently to test them. But again both are hard to do with aggregated economic statistics. Economists should heed Koopmans call to avoid ‘Modelling without Theory’ and equally avoid John Eatwells conclusion that if the data does not concurr with the model to hell with the data. Or in other words only time will tell. Well there may be other solutions. The gatherers of economic data can help. Lets say a statistical office gathers a large sample set and then splits it into two sets A and B. A researcher does not know which set they get. Now lets say they then formulate a hypothesis but this is tested – blindly by a researcher who has access to the other half of the data. This is replication and the statistical power of using both the A and B data is far higher than that of using a single large sample. 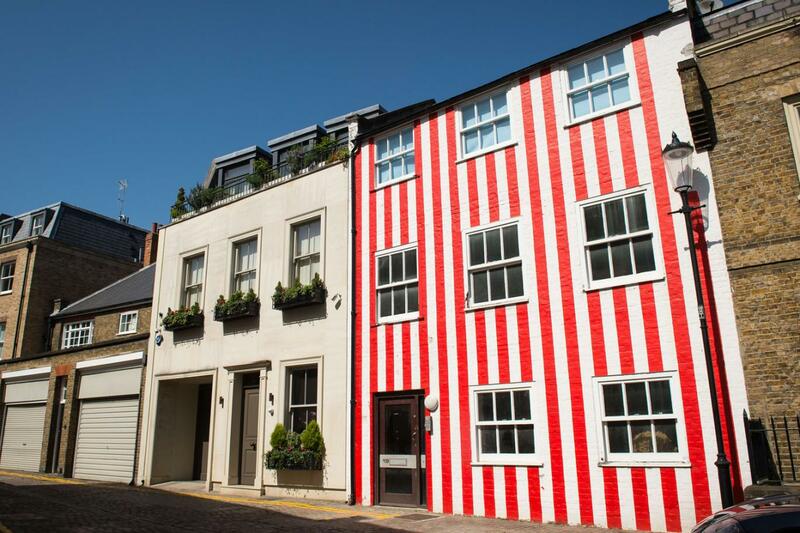 The woman who owns Kensington’s notorious multimillion-pound red and white “striped house” has won a High Court battle to keep the eye-catching stripes. Property developer Zipporah Lisle-Mainwaring won her case against the planning authority’s order to repaint the property. She painted candy stripes on the facade of the three-storey terraced building in South End, Kensington, west London, in March 2015. She has denied that the paint job was done to spite neighbours who objected to her plans to demolish the property, currently used for storage, and replace it with a new home. After failed appeals to magistrates and Isleworth Crown Court last year over the requirement to repaint the property white, Ms Lisle-Mainwaring launched judicial review action at the High Court in London. On Monday, a judge ruled in her favour and quashed the notice. He ruled: “In my judgment, to allow a local planning authority (LPA) to use section 215 to deal with questions of aesthetics, as opposed to disrepair or dilapidation, falls outside the intention and spirit of the Planning Code. “An LPA has the power to limit permitted development rights or to discontinue lawful uses, but not without payment of compensation. Kensington and Chelsea “had ample steps available to it under the Planning Code, which would have exposed it to minimal cost. Under section 102 it could have issued a notice requiring the repainting of the building”. Will a ‘Fair shares’ housing numbers carve up – without any strategic planning – meet the Duty to Cooperate? A trend in some areas, notably Greater Birmingham, is for there strategic plans to be based on a pro-rata population based carve up of SHMA numbers rather than a planned one, least of all one subject to options appraisal and SEA, where areas with greatest opportunity having highest numbers. The basis for this is where unanimity is the rule the receivers will not be able to sell it. Such a carve up, similar to old style structure plan county carve ups – need involve no planning at all. In terms of the soundness test of positively prepared the proposed change to make ‘an effective plan’ the test rather than ‘the most effective plan’ the change would go backwards in making it impossible to point to a better more sustainable location elsewhere as the lcoation for development. this change would be the antithesis of planning. it would be planning by spreadsheet rather than planning by analysis and geography. It would prevent objectors making democratic arguments about alternatives and hence probably contrary to the common law tests on public consultation. In terms of the legal tests – well of course the DTC is not a duty to agree (my term) but mere cooperation is not enough. The test legal test as guidance makes clear is to ‘to maximise the effectiveness of Local and Marine Plan preparation’ and so (say) all authorities got together and agreed no housing that would not be an effective plan. Mere agreement does not comply with the duty – it must positively agree and maximise the effectiveness of that agreement. So a spreadhseet based carve up- without analysis of alternatives – would breach the duty in my opinion, before even considering whether common consultation law and EU SEA law would have been breached as well (which they would have been). Developers behind plans to build nearly 2,000 homes on the former Wisley Airfield claim that a recent telephone poll of 500 residents, aged 18-40, shows a surge in support for a new community to be constructed on a “strategic site” still ear-marked for development in the most recent draft Local Plan. In a press release Wisley Property Investments Ltd (WPIL) state: “The latest results show a significant majority of those surveyed (57 per cent) are in favour of the proposals to redevelop the abandoned site. But a spokesman for Wisley Action Group, which is objecting to the development proposals, criticised the scale of the survey and the claim that it would provide affordable houses. The telephone survey, undertaken by market research agency Marketing Means on behalf of WPIL, interviewed 500 Guildford Borough residents aged 18-40 in February and March this year. The press release continued: “The survey tested views on plans for a new community at the Wisley Airfield which can deliver up to 800 subsidised and 1200 market homes, community facilities, shops, sports facilities and a huge parkland area. The proposals make use of the abandoned airfield at Wisley which, featuring more than 70 acres of crumbling concrete and hardstanding, including a runway over a mile long, is an obvious choice for development. Project director Mike Murray said: “Younger people in the borough are frequently ignored when it comes to housing. This survey makes it clear just how many Guildford residents want to own their own home and how many are struggling to do so. That means many are having to live with their families or are being forced out of the area entirely. “Wisley Airfield was abandoned more than 30 years ago and has more than 70 acres of crumbling runway and hardstanding. It sits near the A3 and is within easy cycling distance of several railway stations. With house prices running at 14 times average earnings, and a majority of young people in support, surely now is the time for sites like Wisley to deliver. Tony Edwards of Wisley Action Group said: “In the real world, where facts always outweigh fantasies, a credible survey is usually a 2,000+ sample. 500 doesn’t really cut it for me, especially when over 2,000 people have already objected to the proposal. Council leader Paul Spooner told The Dragon in a recent interview that he did not expect the developments included in the new draft Local Plan to significantly effect house prices in Guildford Borough. Surrey has some of the highest rents and house prices in the country. The average monthly rent in Surrey is £1,859 – almost double the level in Sussex or Kent. Rightmove gives the average house price in Surrey as £509,000 – 18 times the average Guildford salary 0f £28,000 (source The Guardian). In the quest to fix Miami’s housing gap between rich and poor neighborhoods, even churches can be part of the problem. At a forum Wednesday focused on “The State of Black Miami,” a top advocate for expanding prosperity into minority neighborhoods said one hurdle comes from seldom-used churches taking up valuable land. Jordan made her comments during a discussion on community development in Miami-Dade, with a debate over how best to spread prosperity from the affluent enclaves of the county to majority-black neighborhoods where incomes and homeownership levels lag. Jordan and others noted that while housing can be affordable in poorer neighborhoods, Miami-Dade shouldn’t allow developers and public-housing agencies to cram all low-cost options into certain areas of town. “People living in Miami Gardens, North Miami, Hialeah, Opa-locka, they go to work in downtown Miami and on Miami Beach,” said Miami Gardens Mayor Oliver Gilbert. “We need to actively make sure that workforce housing goes where working people are actually working. I DON’T WANT TO OFFEND ANY PASTORS WE HAVE OUT THERE. BUT WE HAVE TOO MANY CHURCHES AND NOT ENOUGH BEDS. Black residents make up about 18 percent of the county’s population, through communities that include African Americans and Caribbean Americans, with a concentration of people with roots in Haiti and the Bahamas. The ethnic mix has further complicated efforts to pursue a common agenda, said Jean Monestime, the Miami-Dade commissioner who organized the event. “Though we as black people share a common heritage, we seldom unite in pursuit of shared interests,” said Monestime, the commission’s first Haitian-American member. Jordan last year proposed a county law requiring developers of new projects to either set aside a portion of homes for working-class buyers or pay into a fund to subsidize similar units elsewhere. In exchange, Miami-Dade would let the developers build beyond density restrictions in zoning codes. …In neighborhoods where seldom-used churches are common, Jordan said there’s a double downside: Not only is the land not available for a more active commercial use that could bring life to the area, churches — like all nonprofits — don’t pay property taxes on real estate they own. Just as SoS appeal decisions favour refusals before a general election and approval just after; just after a general election is the time to take tough decisions. The housing White Paper was a tinkering exercise. On this blog i’m no longer interested in tinkering. ‘Sajid David wanted a ónce and for all’solution to housing, we haven’t got it. So what is the big problem? Many local planning authorities are not planning for enough housing and plans are non-existent, delayed for years and out of date. Although there are problems in places like York and Bristol by far the biggest problems occur with London, Birmingham and Manchester whose housing needs and backlog total over 2 million dwellings over 20 years. By far the biggest delays in local plan making is in the Green Belt districts surrounding these cities, who now have no incentive at all in updating local plans with reviewed Green Belts, as the precedent of the South Banfleet decision shows even if a site has a draft allocated in a local plan delayed for years the SoS will not approve it. Therefore the whole concept of the big stick incentive of ‘the NPPF simply doesnt apply in these areas – the NPPF alone doesn’t work. It needs an additional measure. Real Politik suggests that trying to deal within all overspill with Green Belt reviews wont be possible. The scale is too high and not all Green Belt sites are accessible. Sadiq Khan holds an effective veto over Green Belt release in London which is untenable, as his his idea that London completions can double whilst retaining the same spatial policies. Some sites will need to be release both in London and the ROSE Green Belt and in Manchester and Birmingham, but this needs to be part of a political deal where sites are only released where they have strong justification such as funding new transport links such as Crossrail 2. The quid pro-quo of such a deal would be diverting most of the growth to well connected towns beyond the Green Belt but connected to the conurbations. This is where the NIC and the proposed Oxford-MK-Cambridge Study comes in. A grand deal might see say 50% of London’s overspill and 1/3rd of Brum’s overspill located in these areas, the rest in other areas outside the Green Belt, some additional intensification and selective urban extensions on sites around London’s urban fringe and in Green Belt towns. The same logic as I have suggested could apply to the Inner Thames Gateway (which might accommodate say 15% of London’s overspill) and Crewe which might accommodate say half of Manchester overspill. The speak quietly but carry a big stick principle applies here, for the SoS can say EITHER LPAs work cooperative to agree amongst themselves a distribution of overspill or the SoS will take over plan making in these areas and agree a distribution for them. The SoS would also be wise to depoliticize such decisions, giving reverse powers over the final phase of plan making was a big mistake. Rather the SoS should introduce binding inspectors reports for the new style regional plans. Once sites for major growth – which will surely include New Garden Cities – are proposed then the powers of teh Taylor Amendment to theNeighbourhood Planning Bill coem into force, LPAs could set up development corporations and purchase land at ‘no scheme’agricultural price, as clearly without a regional plan for Garden Cities there would be no scheme. SoS Dismisses 6 Housing Appeals in One Day – Is there an Election on or Something? Planning developed a protocol for these situations 30 years ago – the ‘permitted assumption’ that a structure plan was adopted in applying the general conformity test – why not the same principle qua local plans and neighbourhood plans? Three developers have threatened a legal challenge to a neighbourhood plan while a referendum on its adoption is in progress. Bewley Homes, Wates Developments and Catesby Property Group want to halt the plan for Farnham, based on legal advice they received last winter. A Waverley Borough Council spokesperson said: “The council has received a threat of a legal challenge and is currently seeking legal advice. “However the Farnham Neighbourhood Plan referendum is proceeding as planned [on 4 May]”. Advice to the developers from Rupert Warren QC, tabled during the inquiry into the plan, said its approach of allocating sites using a new Built Up Area Boundary was “contrary to the strategic policies of the adopted local plan, and is likely to fail against at least two of the basic conditions. Mr Warren explained: “The central problem with the [neighbourhood plan] as currently drafted largely stems from the way its emergence falls between the saved policies of the Local Plan for the area and the as yet untested replacement local plan. “[It] understandably seeks to provide for the prospective housing needs of the area, but in circumstances where those needs have not been tested and incorporated into a set of strategic policies at the local planning authority level. Development strategy is described in Farnham’s plan as focussed on “well designed development on brownfield sites within the built up area of Farnham whilst proposing further sites for housing development and a new business site on a range of greenfield sites”, though avoiding areas in the green belt, at risk of flooding or within the Surrey Hills area of outstanding natural beauty. It also aimed to prevent towns coalescing and said “housing development should be directed away from Farnham”.